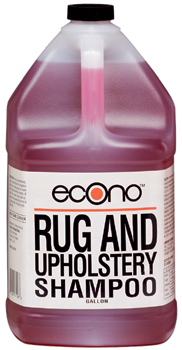 Econo Rug & Upholstery Shampoo penetrates deep to thoroughly cleaned soiled rugs, carpets and cloth surfaces. Econo Rug & Upholstery creates mounds of suds with limited wetting. It helps restore original colors, providing radiant results. It is highly concentrated for greatest economy, and is especially designed for manual application. 1. Pour 1 quart concentrate into a 5 gallon pail. 2. Direct a strong spray of water into the pail to develop mounds of suds. 3. With a brush, apply suds to surface to be cleaned. 4. Brush in a circular motion. 5. Wipe dry with clean cloth.